Home»Blog»Effects of E-Waste»What is E-Waste and Why is It a Problem ? This guide sets out to give you the answer to this question. Electronic waste, or e-waste can describe any type of unwanted electrical or electronic device. Even used products that are earmarked for reuse, resale, recycling or salvage can fall in to the category or e-waste. Electronics that are included in the category of ewaste include electronic office equipment, entertainment devices, mobile phones, old computers, refrigerators and TVs as well as global positioning devices and more. 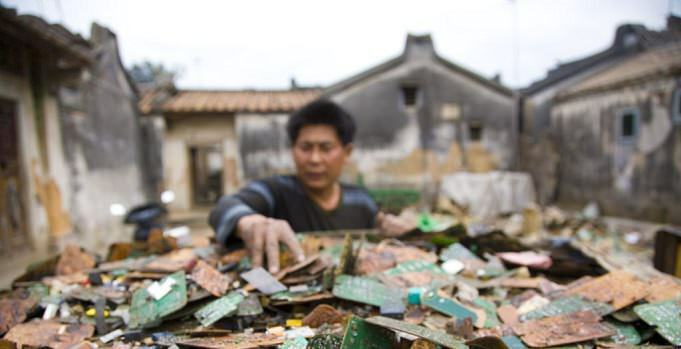 What is electronic waste and why is it a problem for the environment and our health? E-waste becomes a problem when it is not managed properly. When you are disposing of your used electronics, you have four options to choose from. You can throw out your electric devices, you can recycle them, you can resell them to people who will find them useful, or you can donate them to a reputable charity or takeback program. When we choose to throw away our old electronics, they will sit in landfills for years and years and the toxics that are contained in the metal parts of electric devices will leach in to the soil, polluting ground water. What’s more, these toxic substances will be released in to the air, damaging the atmosphere. Our children will be affected by improper management of e-waste because their mental development is harmed by exposure to the lead in these products. When disposed of in an inappropriate way, materials in electronics can cause reproductive disorders, endocrine disruption and a host of other issues. The lead that is in e-waste is toxic to the kidneys and it will collect in the body and eventually have negative effects on our reproductive systems and nervous systems. PVC is another component in e-waste and when it is burned it produces dioxins, which can be some of the most toxic carcinogens known to humankind. Barium that is inside electronic waste will cause swelling of the brain after only a brief exposure. It can cause muscle and heart weakness and liver and spleen damage. Long term exposure to Cadmium will produce kidney and bone damage. What is e-waste and why is it a growing problem? There are things you can do to curb this growing problem. You can donate your used electronics while they are still useful to charities, or sell them to reduce the increase in e-waste. Never throw out ewaste like used batteries, and look up your local areas guidelines on e-waste recycling. Hopefully this article has educated you as to what is e-waste, and why it is a problem.